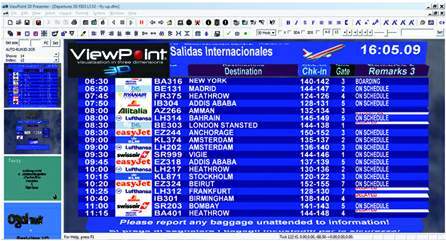 The contract to supply a ViewPoint 3D Flight Information Display system was issued in January 2012 by the Italian airports authority SAGAT. The system was developed using the latest ViewPoint 3D advanced FIDS system, and the first phase, for 30 check-in desks, was operational by March 2012. Full details will be released when the system upgrade is completed. The farma ViewPoint digital signage software, and SBB screen controllers have been chosen by a Spanish pharmacy group to run their in-shop promotional channels..
A well-known up-market DIY and home-improvements chains has installed ViewPoint TV channels in its stores in Milan, offering a major improvement to its communications capabilities and in-store image, as can be seen below. The system, using the latest Intel-based ePC media systems, with dual-independent channels, provides the highest quality of digital TV, with real-time and stored content, and video at broadcast quality. All managed by ViewPoint central servers, providing a flexible and reliablemulti-channel TV solution at a fraction of the usual cost. The system has been operational since August running 14 hours a day, with perfect reliability, and content production has been problem-free. The system is covered by a 3-year on-site swap-out warranty provided by ViewPoint and backed by Samsung and Intel Corp.